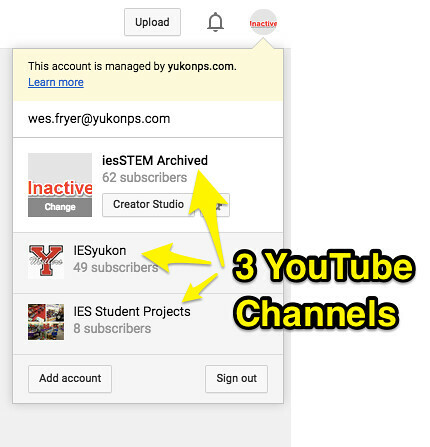 Our “IES Student Projects” YouTube channel, which has 100 videos, 8 subscribers, and 555 views. Projects like Visual Notes Green Screen Videos (by Gifted Education students) and our Spring 2015 Enhanced eBook Project videos were uploaded last year to this shared channel. This channel doesn’t have a custom URL, since I created it after YouTube changed its policies for custom channel URLs. Channels now must have at least 500 subscribers to register a custom name, as well as meet other requirements. When you have access to manage more than one YouTube channel with your Google account, you can select the active channel you want to manage by clicking on your channel icon/avatar in the upper right corner of the YouTube site in your browser. Then select the desired channel below. 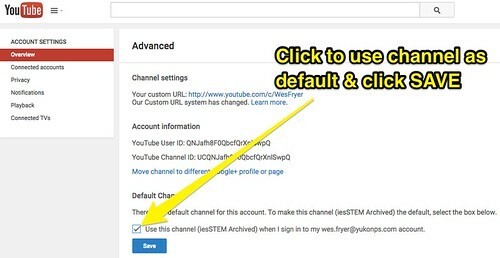 After clicking your channel icon and selecting the desired channel, click the channel icon again (upper right corner) and click on the GEAR ICON beside your selected channel to change its YouTubesettings. 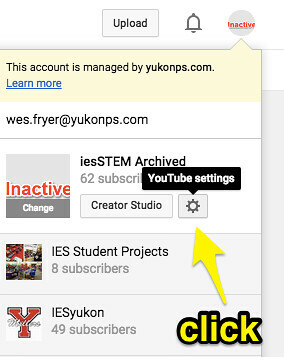 You will now be viewing the OVERVIEW page for your YouTube settings. Next, click the word ADVANCED below your Google Account name in the center of the screen. Finally, on this third screen, click the checkbox at the bottom to make your selected channel your DEFAULT YouTube channel. Click SAVE. Now when you login to YouTube from an app like iMovie for iPad and choose to UPLOAD a video, it should (by default) go into your newly selected default channel. If you want the flexibility to change which channel you upload into, use a free app like YouTube Capture. You can select your desired Google Account as well as YouTube channel from the settings in the app. 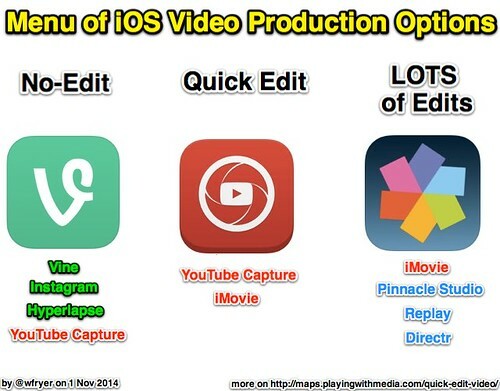 For more tips and tricks about using YouTube and other videography apps / websites, check out the “Quick Edit Video” page of ShowWithMedia.com. Later this summer I’ll be publishing an “eBook single” on Quick Edit Videography on the PlayingWithMedia.com eStore.